This conference aimed to foster a deeper engagement between Intergovernmental Panel on Climate Change (IPCC) authors and leaders from the industry, finance, and academia. 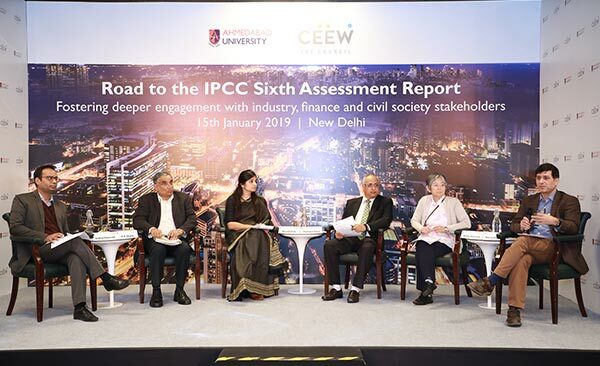 It focused to build on the existing IPCC Assessment process and inform it by discussing ways and approaches to make the assessments more relevant to the industry and financial world. In the future, the purpose is to move from high-level assessments to informed action on the ground. In the opening address, Prof. P.R. Shukla, Co-Chair, IPCC Working Group III, Ahmedabad University highlighted that the window for action is rapidly closing, since 65 per cent of our carbon budget for a 2-degree temperature rise pathway has already been used. During the special address, Dr J.R. Bhatt, Adviser, Ministry of Environment, Forest and Climate Change (MoEFCC), Government of India emphasised the importance of IPCC and how its efforts since 1988 have increased the visibility of climate change as a global issue. He also stressed that developing countries like India must look for low-carbon development models that are very different from the models that developed countries have used so far. Prof. Jim Skea, Co-Chair, IPCC Working Group III, Imperial College London, outlined the assessment process and highlighted the ambitions for the Sixth Assessment Report, that aims to integrate long-term goals with action-oriented steps, use a wide range of scientific disciplines for its assessments and link climate change mitigation with the SDGs. He also introduced how researchers across the globe, specifically from developing countries, could contribute to the IPCC assessments as authors, reviewers and scientists. Industries must move towards cleaner fuel sources, energy and resource efficiency, waste management for deep decarbonisation. Policy support, such as the 30 per cent requirement for slack and ash-based cement in construction, is crucial. Demand management through lifestyle changes and circular/sharing economy will help decarbonisation of industries. Finance is one of the biggest challenges in deployment of renewable energy. Mobilising international resources through negotiations and domestic low-cost finance through banks is required. Long-term finance schemes such as mutual funds (pension funds etc.) for debt availability must be created.